I completed the above quilt, which I named Lagoon, last week. I made this quilt to document the process for the final Advanced Landscape Video in my Artful Quilting Course. It was quite a challenge to create a big landscape quilt while trying to break the whole process down into manageable steps. It was also a challenge to stop and rearrange my studio with lights, camera, and microphone to all be in optimal positions while trying not to trip over cords while making the quilt. In a simple quilt that’s all manageable but in this one, not so much. My creative process is not necessarily very linear. For example, some of the leaves I used in this quilt were actually made 18 months ago. I loved these leaves and knew I would use them some day but just wasn’t sure when. I kept them pinned to my design wall all that time, hoping for a perfect moment. Two weeks ago, as I started planning this quilt, I had that “bingo” moment. The colors of the background and the colors of those big caladium leaves were a perfect team. I had one small problem which didn’t occur to me until I was well into the quilting process. I hadn’t designed those leaves. They were generously given to me by Betty Busby when I took her course at Quilt Surface Design Symposium. She freely gave the leaf image to me to use in my work. My problem was that the image wasn’t mine to give away to all my potential students to copy and use in their quilts. Problem solved: I spent some long hours drawing and being thankful for my Photoshop skills as I designed and came up with a new caladium leaf for my students. It’s not as gorgeous as Betty’s but it will have to suffice. 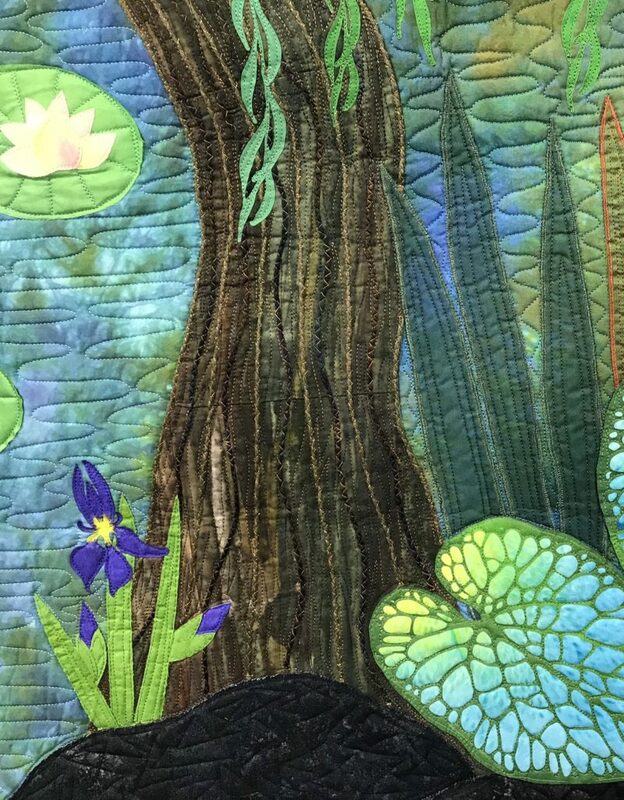 Just to explain, the willow leaves, the iris, and the caladium leaves are made from evolon, a nylon/polyester microfiber product which is painted, cut out with a cutting machine, then stitched to the surface of the quilt. The logic behind using this product is that it loves ink and does not fray. Thus, it is ideal for those quilters who enjoy experimenting with surface design. The iris are actually colored with Inktense Pencils rather than paint. These pencils are great since they turn into ink when you add water to them. Magical things happen in terms of shading and blending. They are then heat set to make them colorfast. The tree trunk is a commercial striped batik and I used my dressmaking skills to add lots of darts here and there to make it behave the way I wanted it to behave. I wanted to keep the grain of the batik stripe flowing in a logical way. Here you can see the couching of yarn I did on the tree trunk. Lots of couching to hide the darts and create texture. I also added some spiky satin stitched organza leaves behind the caladiums. 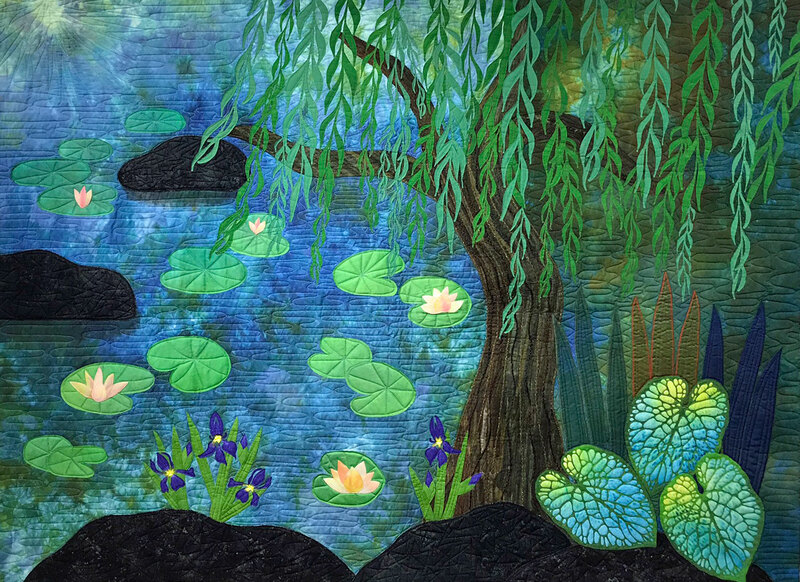 Lisa Reber’s lovely hand dyed fabric is used for the background and the lily pad blossoms. Her work is always so inspiring. Best news of all, I posted this on Facebook when it was finished and it found a new home within hours. It will be going to a lake house in New York. How great is that?